Defense objective is to press the ball on the wing without fouling, to make his only good pass opportunity (the long pass across the pool to the open opposite wing) difficult. All other defensive players must press to prevent dry passes. Leave only the opposite wing open. If the offense gets the pass across the pool to opposite wing, defenders shift and pressure on the ball (without foul) continues. The defenders on top can cheat down briefly on the pass to protect against an RB by the post men during the slide of the front line defenders. Free-throw scenario. The free-thrower is left open. The free-thrower must make a pass and get a quick return before he can shoot. The defense tries to prevent this. The free-throw will probably go up top, and the front-line defenders should slide to the strong side. After the free throw, the top defender presses to prevent a good pass. 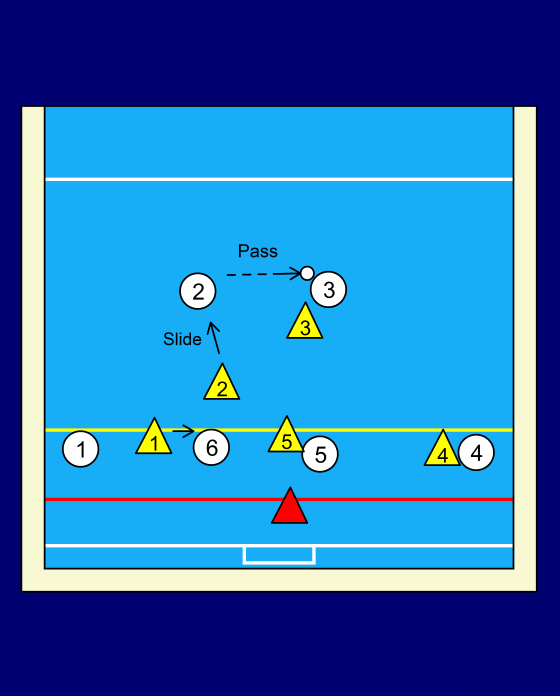 The front-line defenders have slid, so the only threat is the longest pass, to the open opposite wing. Top defender's job is to make the pass difficult. If a foul occurs on top, the top defender slides in during the free throw, then immediately back out once the pass is made to another player. Successful free throw pass results in the defender sliding back out and the front line sliding to the strong side.